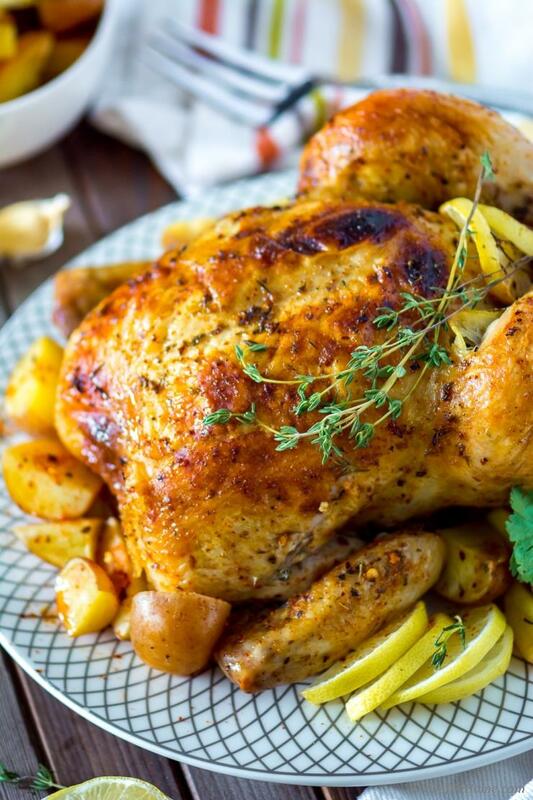 Lemon, thyme, and spices marinated, juicy oven roasted whole chicken with roasted potatoes. Guide to roast perfect whole chicken every time. 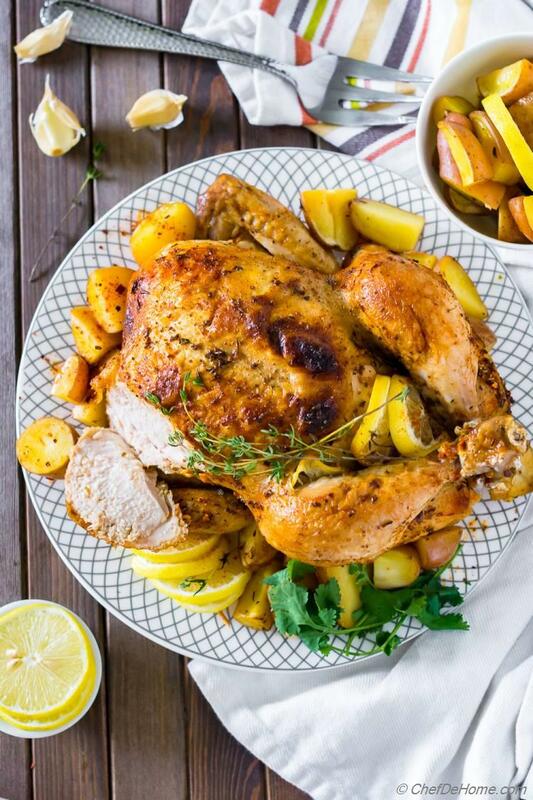 Sharing today, lemon, thyme, and spices marinated, juicy oven roasted whole chicken with roasted potatoes that soak in all flavor while chicken cooks in oven. 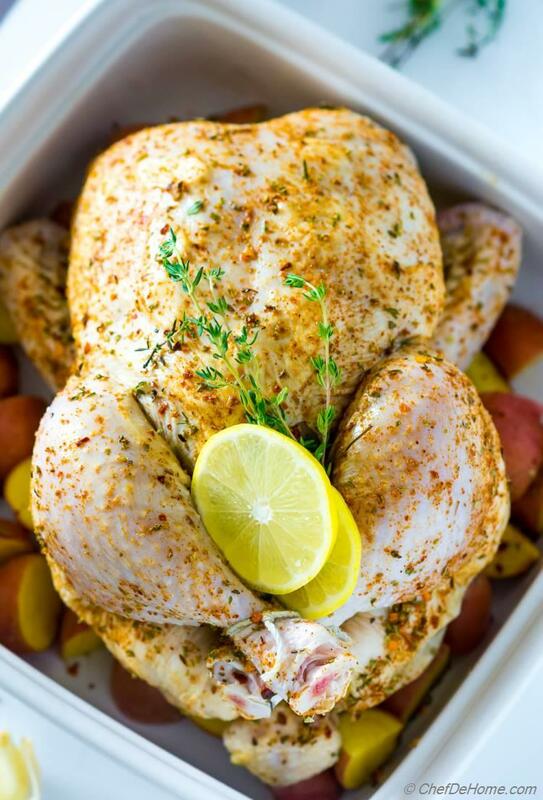 Oh, and since time of baking and family gatherings is finally here.. :) With this recipe, I'm also sharing tips to pull a worry free, moist, juicy and flavorful chicken roast. 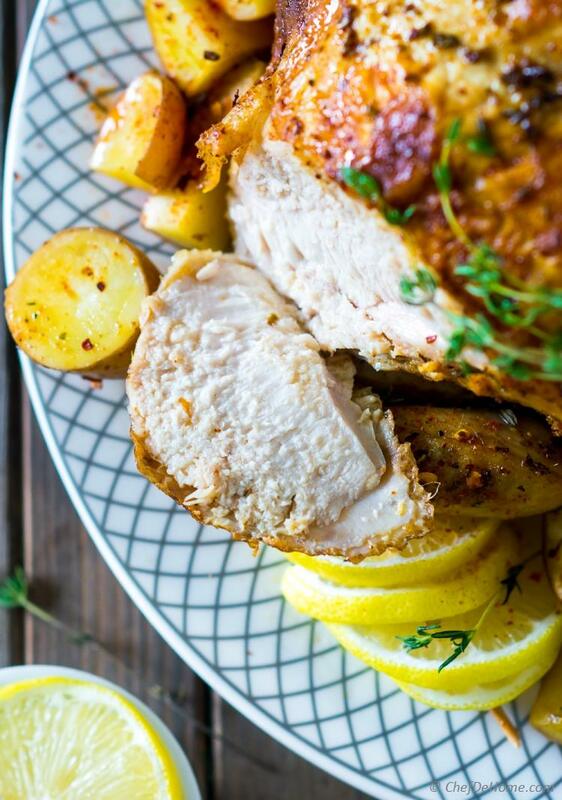 Take this recipe as two-in-one: a flavor-packed Lemon thyme Chicken Roast and an ultimate guide to roasting perfectly cooked moist whole chicken in the oven. Earlier I have shared recipe for Roasted Game Hens on blog but oven roasted whole chicken recipe is first. So I thought to include all bells and whistles for a worry-free family meal. During fall-winter season, I LOVE bringing a whole chicken from our local butcher over the weekend. Cooking a whole chicken on weekend helps me many ways: cook a family-style Chicken Roast Sunday dinner. Shred leftovers and add to curries, chicken salads, pasta, tacos and a lot more over the weekdays. 1) Well cooked but not dry or burnt. Now, all of the above might sound daunting but honestly, cooking a whole chicken is super-duper easy! Once I understood things to take care of when roasting, everything started falling in it's place.. These days, I'm very comfortable, organized and can pull a flavorful Whole Chicken Roast in about 20 minutes of active time. After no. of chicken I messed in my early cooking days (don't tell anyone).. I call 20 minutes a success. 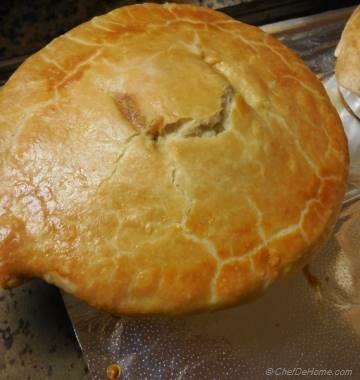 1) Well cooked but not dry or burnt: This is very easy. All you need to know to is temperature of oven and weight of bird. I follow same rule here for chicken or turkey. Both should be well cooked, no sign of raw. Only thing that is different is : weight. So always make sure to check the weight when buying for whole roast. 1) 2-2.5 pound bird: 40-45 minutes at 375 degrees Fahrenheit. 2) 3-4 pound: 50-55 minutes at 375 degrees Fahrenheit. Note: In both cases, check for temperature in thickest part of thigh to be 165 degrees Fahrenheit. Continue cooking until it is not. To prevent burning the wings or exposed bones, I fully cover the ends with aluminium foil. This simple trick works every time. 2) Moist and juicy: The first point is most critical to get a moist bird. However, there is one more thing which will keep chicken moist and also add flavor while cooking whole. It is brine or marination. 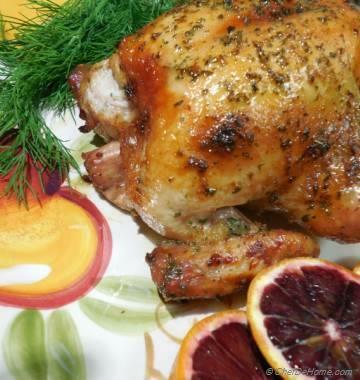 For medium size bird such as whole chicken for this recipe, I prefer to marinate it overnight. Ingredients such as lemon, lime, vinegar, spices, olive oil.. all these tenderize the chicken while marination continues.. The resulting roast is super flavorful and spot-on moist. As Vishal always says, "I love the skin, and all meat around the bones because that gets delicious and bursts with flavor when whole chicken is slow roasted in the oven." I make sure to season chicken below skin, also puncture some slits with knife and insert a piece of spiced garlic here and there, to keep everything delicious. 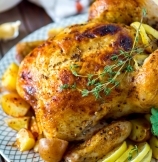 TIP: Cook chicken on top of seasoned potatoes and other root vegetables instead of wire rack. This way flavors drippings from chicken make a flavorful side without any effort. Score! 1) It is economical. One roast can serve 3-4 meals for small family or 1-2 meals for a large family. 2) It is freshest possible, and healthier. 3) It is flavorful and can be spiced-up with simple homemade techniques (check the notes above). So this weekend, bring home whole chicken. Marinate, roast and have fall feast as if it is Thanksgiving rehearsal dinner. :) Don't forget to keep leftovers for few delicious recipes I have planned for next week. Remember, always follow the instructions carefully and never be intimated from roasting a whole chicken (even turkey) ever again! Total Time 1 hr 10 mins Prep Time 20 minutes Cook Time 50 minutes Difficulty Easy Yields 3-4 lb Whole Chicken Serves 4 Notes No. of servings depends on serving size. 1. Prep Chicken: A night before, or 4 hours before roasting, pat dry the chicken. Rub finger through skin on breast, and thighs to loosen it up. Only up-to where skin does not tear. 2. Place chicken on a large prep plate. Massage with mixture of olive oil, lemon zest, soy sauce, lemon juice, minced garlic, 1/2 tsp salt. Make sure to add some to cavity, under the loose skin wherever you get access easily. Now, insert few slices of lemon and sliced garlic under the skin as deep as your fingers can reach without tearing the skin. Add remaining lemon slices, garlic clove , few thyme sprigs in the cavity. I used 10-15 thin lemon slices and 4-5 cloves. 3. Mix chili flakes, paprika, cumin, remaining salt, black pepper, and thyme from 4-5 sprigs into a small bowl. Massage half over the skin. Insert bird in a large plastic bag or seal-able container. Transfer any liquid from prep plate into the container. Cover and refrigerate overnight, or for at-least 4 hours. 4. Roast: Preheat oven at 375 degrees Fahrenheit. In baking dish, add sliced potatoes, season with sprinkle of salt.. Take chicken out of plastic bag and top on potatoes. Massage remaining spice-blend (saved in step 3) on top skin. Roast for 50 minutes to an hour until temperature in thickest part of thigh is 165 degrees Fahrenheit. To prevent over browning.. Tie the legs of bird with twine and cover with aluminium foil. Tuck wings under the breast. 5. Gently brush melted butter on chicken when just out of the oven. Let roasted chicken rest for 15-20 minutes before carving. Serve and enjoy! Hi!! How long would You cook a 6.5 lb whole chicken for in a Dutch oven? Previous recipes say for an hour covered than check every 15 minutes until 165. Do you agree? Hi Emily, 6.5 lb whole chicken will easily take 1 hour 20 minutes at 375 degrees Fahrenheit. That said, cooking for 1 hour (covered), then checking every 15 minutes (until temperature in thickest part is 165 degrees) is safe and will work perfectly. Happy Cooking! Scrumptious! I am always up for a perfectly roasted chicken! Pinning! Colleen, thanks! High five for pin, girl! Yum...This looks wonderful. I could just reach through the screen for that chicken. Lemon slices under the skins is the way to go for full lemon flavor and I love the combination of spices you used. I'm saving this recipe for next time I roast a whole chicken. Thanks for sweet feedback, Ali! Trust me, lemon and garlic under the skin makes Whole Chicken Roasts extra special. I hope you get chance to try it soon. Hi Traci, I agree! Skin gets extra delicious and gorgeous with oven roasting. Sending a big platter your way for breakfast, my friend. Thanks for sharing sweet thoughts. This is a great guide that will help many! Andrea, I'm sure you will enjoy these flavors. 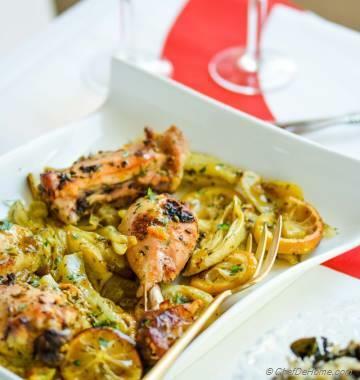 Lemon and garlic with spices make delicious combination of flavors.